Many of Disney’s animated movies have a timeless quality, but not Saludos Amigos and The Three Caballeros. Made with the purpose of bolstering relationships between the United States and her southern neighbors, these movies are very much a product of their time. Even though the propagandistic intent has been lost, Saludos and Caballeros (packaged together on this new DVD called The Classic Caballeros Collection) are still entertaining as cartoons. An interesting behind-the-scenes feature could have been made about these movies, unfortunately this new DVD’s bonus features are sparse. In 1942, Walt Disney and a group of animators and artists traveled to South America and Mexico at the behest of the United States government. The intent was to generate goodwill for the United States and to get ideas for Latin America-themed cartoons which would hopefully generate even more goodwill. The creative results were Saludos Amigos and The Three Caballeros, as well as several shorts not featured on this DVD. At 42 minutes, Saludos Amigos (1942) is pretty thin as a feature film. 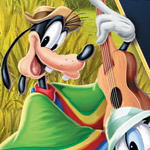 The movie has four animated segments, framed by live-action footage of Disney and his employees sightseeing and meeting South American artists and musicians. In between are Donald Duck’s misadventures at Lake Titicaca, Goofy’s misadventures as a gaucho (cowboy) in Argentina, and a plucky, little anthropomorphized airplane named Pedro, who has misadventures carrying mail over the Andes. The fourth and best segment is Aquarela do Brasil (Watercolor of Brazil, better known in English as Brazil). It starts out with an animated brush, creating a watercolor jungle. It takes a more conventional turn when Donald Duck turns up and meets a new friend, the Jose Carioca, a bright green parrot, who takes him on a tour of a watercolor Rio de Janeiro. The Three Caballeros (1944), at 71 minutes, is also a series of shorts but works better as a cohesive film. The framing device this time has Donald Duck opening birthday presents from Jose Carioca and Panchito, a Mexican rooster. This takes Donald and us on more sightseeing trips south of the border. The first two segments, The Cold-Blooded Penguin and The Flying Gauchito feel more tacked-on. But then Jose takes Donald to the Brazilian city of Bahia, which is first illustrated in stunning bright pinks and purple; Donald dances the samba with some live dancers and by the end of the sequence, the whole city is moving in rhythm to the music. Then it’s on to Mexico with Panchito, where our friends dance, sing and play on the beach with attractive local women. The animators do a good job integrating animation and live action in these sequences. The big finale is a wild psychedelic adventure, and bears a striking similarity to the “Pink Elephants on Parade” sequence from Dumbo. Donald Duck has been overcome by love or lust, according to the movie, but it looks more like he ingested the worm at the bottom of the tequila bottle. While some of Disney’s lesser-known works have gotten lavish DVD treatment (see the Walt Disney Treasures series), other are released with little fanfare and sparse extras. With all of the work that the Disney company did the United States government during the first half of the 1940s, a making-of documentary could have shed an interesting light on these two forgotten movies. In the Backstage Disney section of the DVD is “South of the Border with Disney,” a 33-minute newsreel-style film about the trip made by Disney and his employees to South America and Mexico in 1942. Also in this section is a two-minute excerpt of an interview with Walt by the Canadian Broadcasting Corporation, in which he talks about the trip to South America. Two bonus shorts are also on the disc: Don Donald, made in 1937, has the duck trying to woo a lady duck, while being thwarted by cacti and a stubborn burro. Contrary Condor, from 1944, follows more of Donald’s misadventures in the Andes. The picture is mostly great, making Mexico and Brazil look like vibrant places to visit. Some of the live action/animation scenes are a little grainy, probably due to technological limitations of the 1940s. The sound, which is Dolby Digital, is very good, though unremarkable. The movies are probably best enjoyed in two sittings. Check out all of the extra features, because there’s not much there. “South of the Border with Disney” is skippable, because it covers much of the same material as Saludos Amigos.